Mention Connelly to any knowledgeable pool player and you’ll get a nod in return. In the pool and billiards world, Connelly is a household name. They’ve been around for over 70 years, and while that’s not necessarily an “elder” in pool manufacturing, it’s nothing to scoff at either. They make almost everything related to pool and billiards you can think of - cues, balls, felt etc. 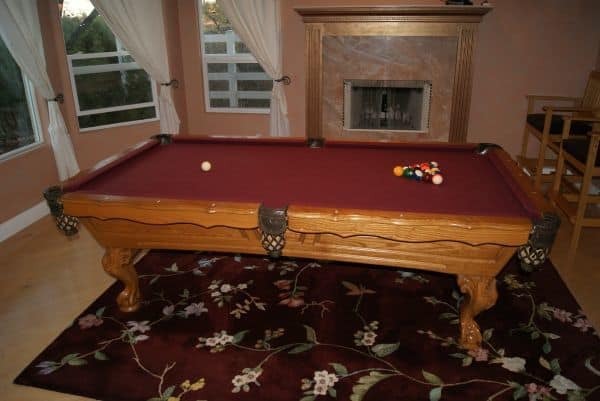 This page will cover Connelly pool tables specifically. If you’re considering a Connelly or you just need a new table, read on! 3 How much do Connelly pool tables cost? As we said, Connelly is a respected name in the industry. They’ve built a reputation for being upfront about their products and delivering quality to every customer, no matter if that customer is buying 1 table for his home or 20 tables for his billiards halls. Built in Texas. No overseas knockoff garbage here. Only the best. Connelly sources products from all over the world (not China) and assembles everything with US specialists in central Texas. Full customizations. Luxury pool tables will always let you customize, but with less-expensive tables, that option is less common. Connelly offers an extreme amount of customization on all of their tables if you pick up the phone and speak to an agent. We’ll give you that phone number at the end of this article. Everything else you’d expect. They look good. They offer great gameplay. They last for decades. Everything you’re looking for in a pool table, you’ll find in a Connelly. You can visit the official product page on the Connelly website for the full selection. Our favorite three offers from them are below. We’ll go over each one and why we like it so much. This isn’t true. If your decor is casual, you need a casual-looking pool table to complement everything. If you get a fancy one, it’ll stick out like a sore thumb and subtract from the ambiance of your room. Kayenta is that “casual” pool table design we love. The Corando is the perfect mix of elegance and minimalism. If you look at the pictures, you’ll see that the table has a classic design… just without so much stuff going on. It looks fancy, but it doesn’t dominate the look of an entire room like the next offering does. The Ventana has a blocky design. The legs are perfect squares and extend straight up and down. The table edges are completely straight in a perfect rectangle. Every measurement is calculated and just “looks right”. If you’re someone who prefers to buck the trend and go with a unique-looking table, go with the Ventana. It’s our favorite non-mainstream offering from Connelly. How much do Connelly pool tables cost? To the public, Connelly sells 10 models of pool tables which range from just over $3,000 all the way to $10,000. The Prescott and Sabino are the cheapest options and the Scottsdale is the most expensive at just over $6,000. Go to the official product page listings to learn more. In general, Connelly will list a base price and then tack on $500 - $1,000 for standard customizations. Anything else (like structural modification) will cost you more, but again, one of the big benefits of buying a Connelly is being able to do these types of specific customizations. The only way to know for sure is to call them up and ask for a quote. Browse the selection by clicking the link above, then go here or call (817) 284-3931 to learn more. All in all, Connelly isn’t a particularly unique pool table company in any specific regard, but when you add everything up, you get fantastic, affordable tables that offer a lot of customization with superior customer support. If you’re getting a new table soon, you should put Connelly on your list of pool table brands to consider. Find Connelly pool tables on Ebay, now!